W e provide laptop repair and service to the RDU Triangle and nationwide for home users, businesses and computer resellers. We have the equipment and the experience to diagnose any problem accurately. 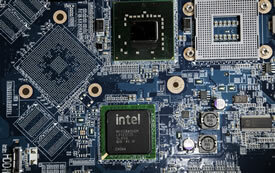 An experienced, certified technician will do all of the work on your laptop. We offer reasonable pricing and will return your laptop as quickly as possible. Diagnostics are free and will typically take only a few business days. After your laptop has been diagnosed, we will call you with details of what is wrong with the unit along with your repair options: after we have completed our diagnostics but before you have started spending money. Then you can decide if you want to have us fix your machine or pick it up for no charge. We repair all types of laptops, including Apple MacBooks, Lenovo/IBM ThinkPad, Acer, Apple, Asus, Compaq, Dell, eMachines, Gateway, HP, Sony Vaio, Panasonic, Toshiba and many other brands. We stock several parts and have access to great pricing on miscellaneous parts. Some laptop parts are very hard to obtain or are overly expensive; for those occasions, we always offer multiple affordable solutions. We are located on the Cary Parkway, just 6 miles off of the Raleigh 440 Beltline (I-40). Our Cary location is convenient to Apex, Fuquay-Varina, Morrisville, Raleigh, RTP, Wake Forest, Durham, Chapel Hill and the surrounding areas. Feel free to contact us at (919) 468-3999 or go here for directions.